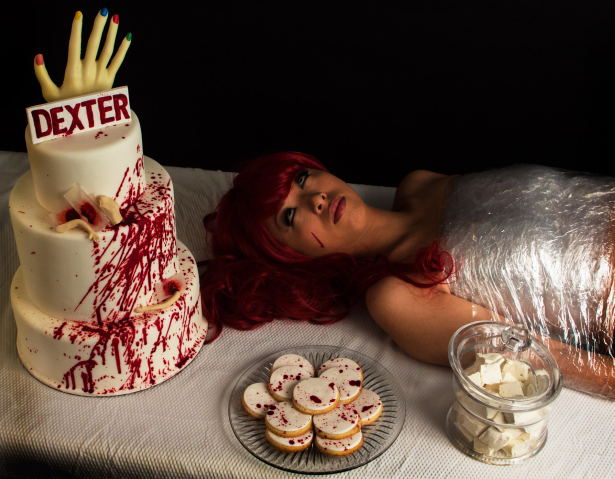 To mark the special Dexter Series Finale event, Cakes Cove presents a Dexter themed Sweet table. 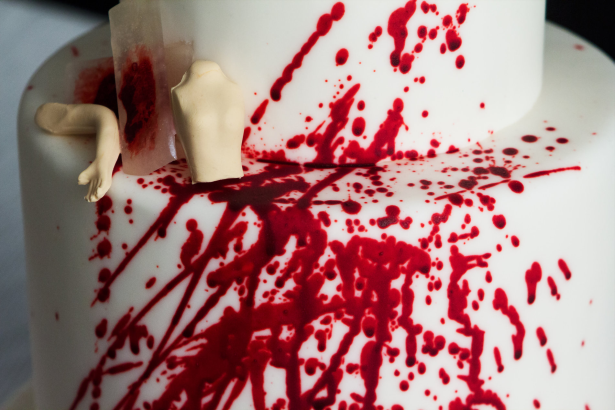 The cake is a spatter analyst's dream decor, accompanied by the Ice Truck Killer's white chocolate hand, sugar blood slides, and fondant body parts. Cut inside to reveal a moist vanilla bean cake, buttercream, and a layer of raspberry puree. Paired with the cake are white chocolate vanilla cookies and vanilla marshmallows, cut and jarred to resemble the cotton swabs Dexter so often uses throughout the series. A personalized version of this sweet table is a great addition to your Dexter series finale party on the 22nd, and there is still time to place your custom order. View two more images after the jump.